Back in my childhood we had no dinner set of crockery or tea set. Poverty ruled the home (something I just wasn’t aware of as a child) and so we had what we had – things that had been given or maybe even found or just possibly bought at jumble sales. The older and stronger members of the family had ‘bagged’ items as theirs and my brother, Robin by name, claimed this plate as his. I was as intensely jealous as the youngest and feeblest in the family dared to be. I don’t recall that I had a specialplate to be mine. Robin’s plate, 12 sided and beautifully coloured, was definitely special. I yearned to have that plate. When, one by one the three children left home, that plate stayed put. But under a better off regime much of the old chipped crockery was passed on. 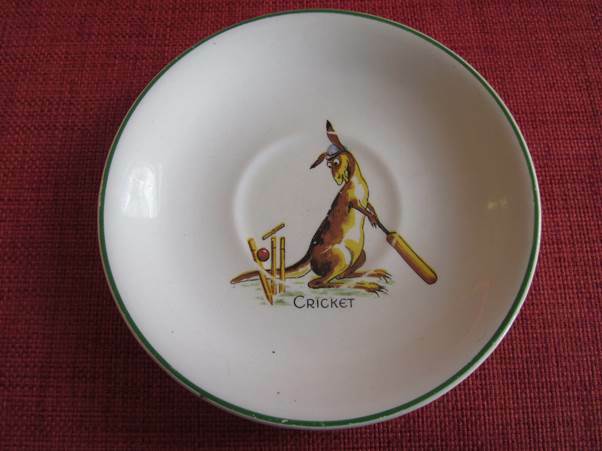 Sadly, my brother died in 1980 – aged just 33 so he never inherited the plate and neither did I. My sister, on the spot, took charge of it and it has been on display in her dining area for years. She died last year and so, after 60 plus years, I have finally inherited the plate. I still love it. Clearly it has a chip so it is of no cash value but for those who want to know, here are maker’s marks. The plate has class. 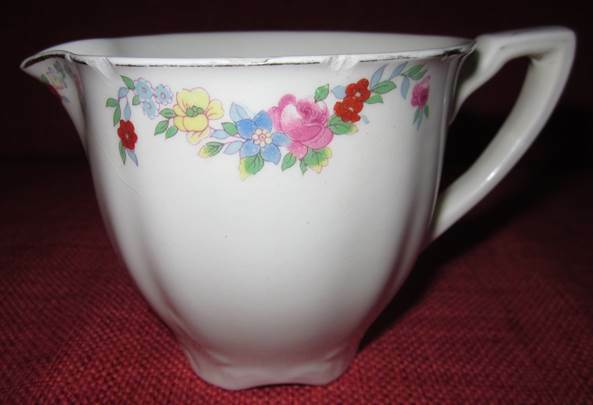 It’s Royal Doulton Merryweather pattern – really quite art deco in style. Clearly my brother, and jealous me, had taste in wanting and liking this plate. And what will I do with it now I have got it? I shall give it to my niece – my brother’s daughter. She was just eight when her dad died and has little to remember him by. I think she needs that plate more than I do. So, I shall enjoy it for a while and then pass it on. Just in case, it has a sticker on the back now which says this should happen. In my memory Uncle Joe worked for Harry Hoad -a pillar of Methodism and proprietor of an oil and hardware shop opposite the Sackville Arch in Bexhill. I do not know just how they were associated; it was not simply master and hired hand. The business depended on hawking away from the shop. Uncle Joe was the principal hawker and had a hawker’s licence. In my earliest memories he called on us every Thursday morning bringing supplies of paraffin, soap, brushes, polishes, pegs and the like -all this carried on a handcart pushed by Uncle Joe and his aide whom I knew only as Dennis. I took all this for granted but it surprises me now that they could cart enough to supply a fairly extensive round -probably 600 households. Later on they had a van with a large paraffin tank fitted under the floor. Dennis drove it but it was Uncle Joe’s round; Dennis was hardly a dynamic salesman. 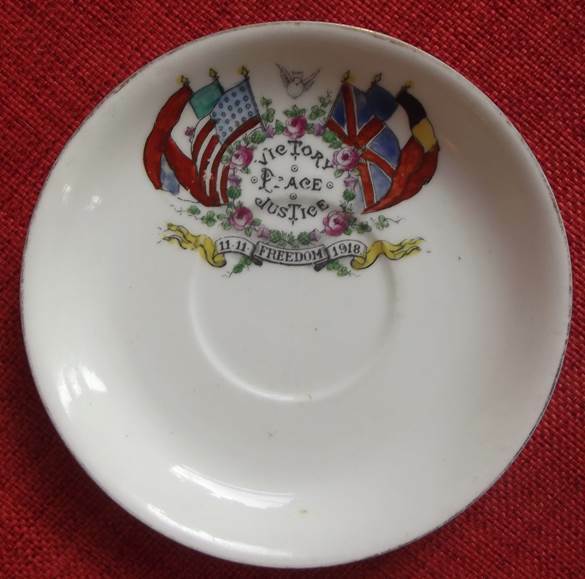 Sometimes they carried what would now be described as ‘special offers’ .I have a snapshot memory of Uncle Joe showing Mum a half pint milk jug with a pattern of violets, said to be a bargain at 6d (2.5 new pence) .I suspect now that Hoad had invested in a job lot of crockery ‘seconds’. I cannot judge whether Mum got a bargain or was conned but the jug came into regular use and I still have it. I am all too aware that I am the last surviving member of my line (I have two cousins much the same age as me) who actually knew Granny. I can feel some sentimental attachment to objects she had and handled. Will anybody else? I think we have looked at the veteran car rally before on this blog (click here). It’s nothing like that this time. 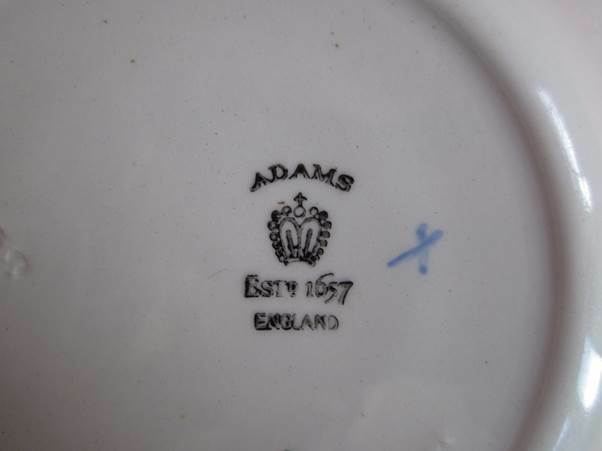 This is about crockery from the past, although still with us. I’ll let my wife say a bit here – really she was talking about 1950s shops in her then home town of Worcester. At Lawley’s, the china shop, a new tea service was chosen. 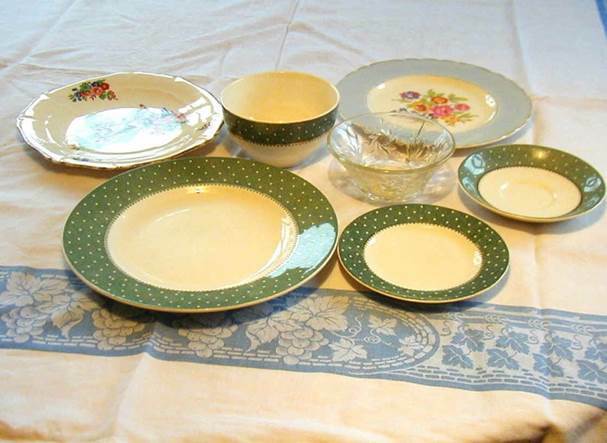 The design was Conway Spot, by Ridgeway, with a green band on the white china, spotted with white polka dots and edged with a fine gold line. We bought a few items at a time, as we could afford them, rather in the way that balls of knitting wool were put in a lay-by, to be purchased as needed. When I first started dating my girlfriend I was in for a bit of a shock in terms of life style. In my household we never had matching crockery. We all had our own favourite plates, knives, forks and spoons although I, as the youngest, had to make do with what others didn’t want. Some items we just didn’t have. So, for example, in that Conway Spot set shown there is what I discovered was called a slop basin – for tipping tea dregs into before a second cup was poured. We never had one of them. 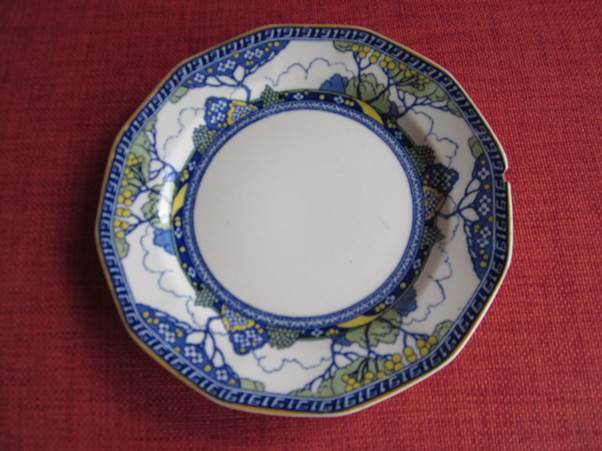 But we did have large dinner plates, tea plates and cups and saucers. Mum used to bake cakes and these might have been put on a decorative plate – we had some. The glass item in the photo was a sugar bowl and we certainly had one of them for back in the 50s we all laced our tea with spoonsful of sugar. Oddly, I don’t remember a table cloth in my home. At a very early stage I remember dad bought Formica and impact adhesive and covered the table which then became a wipe clean affair. Actually, early photos do show a table cloth sometimes. By the way, my wife, always more dedicated than me put together a lovely book about her childhood and I have nabbed photo and paragraph about it from that. 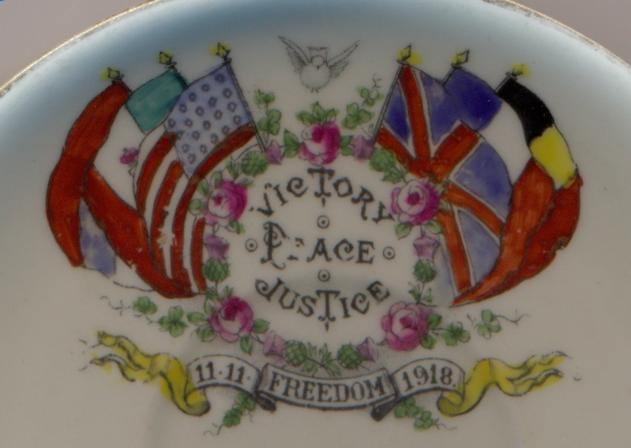 We were looking for memorabilia and we came across a saucer we had. Actually, this commemorates not the start but the end of the war. At least the peace could be celebrated, even if ‘a land fit for heroes’ turned out to be light years away from the truth. It’s quite a pretty little thing and of course, it should have a cup – but we don’t have that. The emblem is attractivealthough we can see in an enlargement that the painting or transfer print was not very high quality. No doubt somebody, pleased the war was over and maybe their man was coming home, was persuaded to part with some cash to buy what is a purely commercial item. 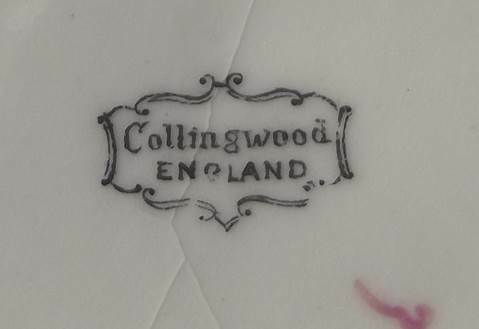 It was made by Collingwood. As to where we acquired it, we are not quite sure. My wife thinks we bought it cheaply in a second hand shop somewhere. Wherever it came from it is quite a sweet little thing. Maybe for some it will indicate a victory for good over evil. For me it commemorates a very hollow victory.